I’ve walked the aisles of lots of trade shows lately and love to see how companies are reinventing the traditional 10′ x 10′ booth experience. ICFF certainly did not disappoint. I saw a number of unusual and intriguing displays. While I could go on forever, these two exhibits were just as well thought out as the products they were introducing. 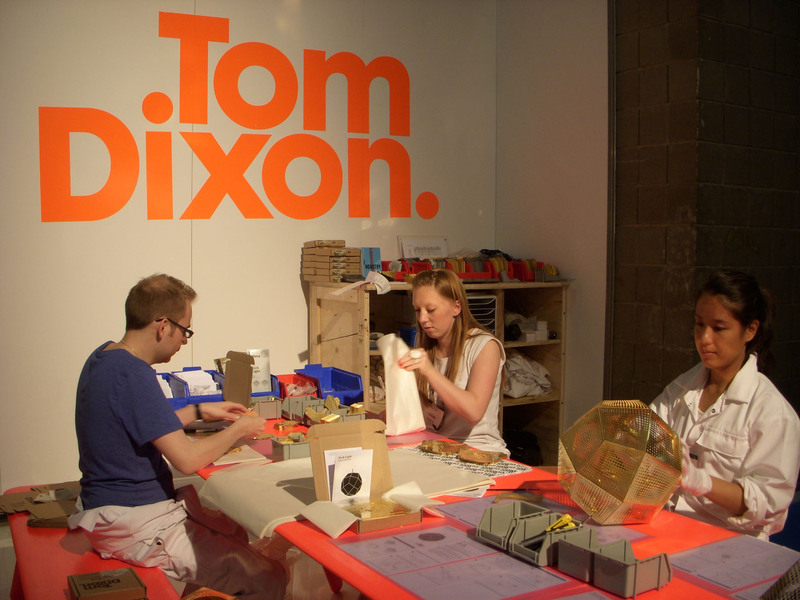 Talk about production process, we got to watch as DIYers read through the instructions and pieced together Tom Dixon’s new Etch lamp. As someone who is about to move into a new apartment, I just love the simplicity and compactness of the packaging and the “wow effect” the lamp creates when it all comes together (not to mention the fact that you could buy it off the show floor!) 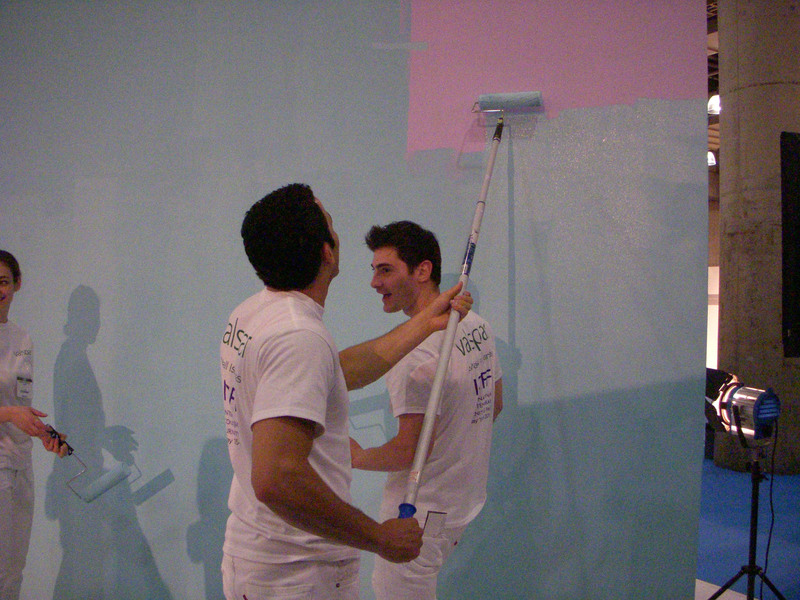 Speaking of moving and interactive exhibits, the Valspar booth totally grabbed my attention. I saw three painters transform the wall from “Playful Petal” to “Beach Sparkle” using one coat of paint from Valspar’s new Hi-Def Advanced Color System (which, in case you’re wondering, is available at Lowes!) I also walked away with a sample and paint brush so I can try it at home. 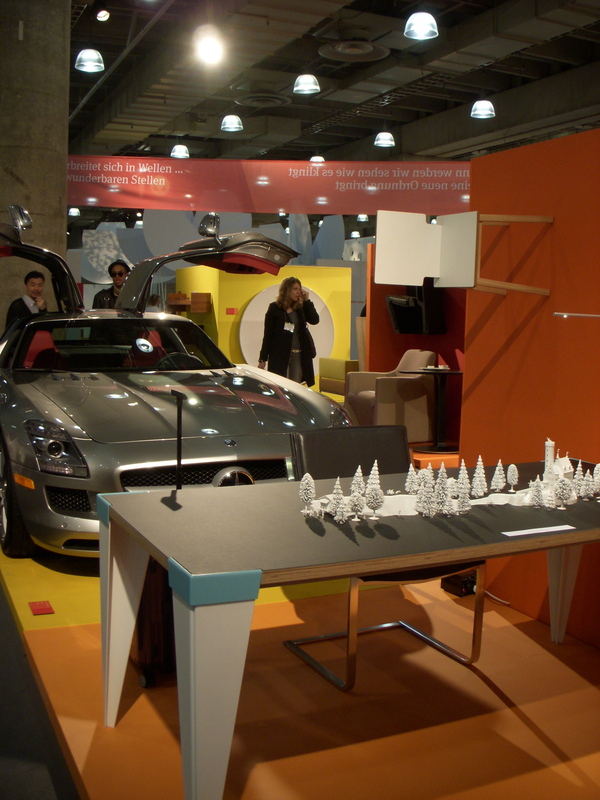 The Design Deutschland booth was a great resource for this trend as it was all about luxury. The space was replete with stunning design and decadent objects – all produced with cutting-edge German know-how. Straight out of Stuttgart, Mercedes-Benz dazzled us with their latest creation, the SLS AMG. Boasting a carbon-fiber-laced interior and racy gull wing doors, this auto isn’t just for show — it can rev from 0 to 60 mph in a reported 3.7 seconds. The decadence didn’t end there. While munching on the delicious Bavarian pretzels the booth had on offer, we spotted a gorgeous hand shower. With a sleek white and chrome dual-finish, Hansgrohe’s PuraVida 150 AIR hand shower was a shining example of fresh design combined with top-notch German engineering. Its generously proportioned face resembles a chic hand mirror on one side. On the other, a proliferation of rubber nozzles deliver Hansgrohe’s proprietary AIR technology. This innovation blends air bubbles with the water stream in a 3:1 ratio, creating a softer and more relaxing shower. Native to Schiltach in the Black Forest, Hansgrohe also suited this model up with 5 pampering spray modes that change via an “EasyClick™” spray selector. “Designer collaborations” have become such a common part of the design industry that they are practically a show standard. Having said that, I really liked seeing the firms and companies who took design classics and interpreted them in different, unexpected ways. 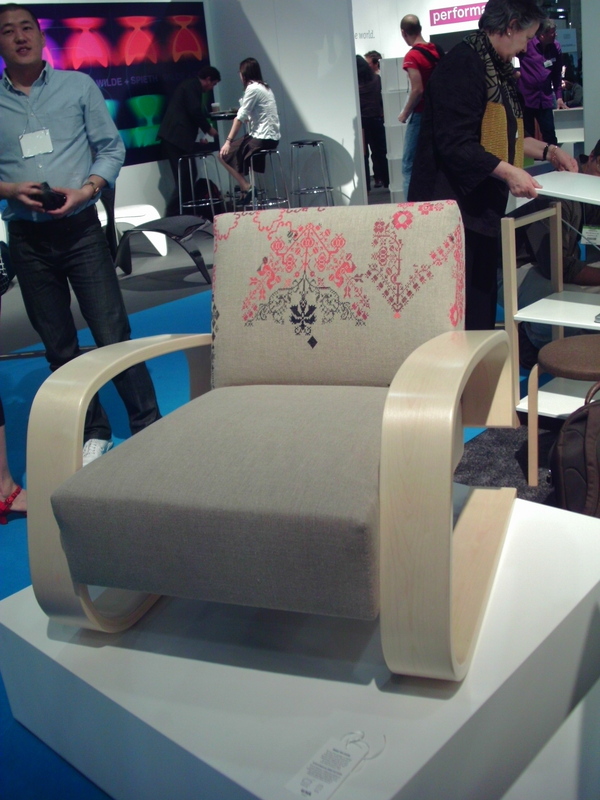 Among my favorites this year was Artek’s booth, with their DRESS THE CHAIR! campaign in full swing — the company enlisted famed textile designer Michael Maharam to collaborate in a project to cover the Armchair 400, originally designed by Aalvar Aalto. The result — three gorgeous, individual “tanks”, as the chairs are affectionately known, one with embroidery by Sabine Steinmar, one with custom hand-felted wool by Claudy Jongstra, and one cloaked in Maharam’s signature brushed Merino felt. The furniture itself becomes a premise for exhibition, and this aspect of Artek’s mission really fascinates me. 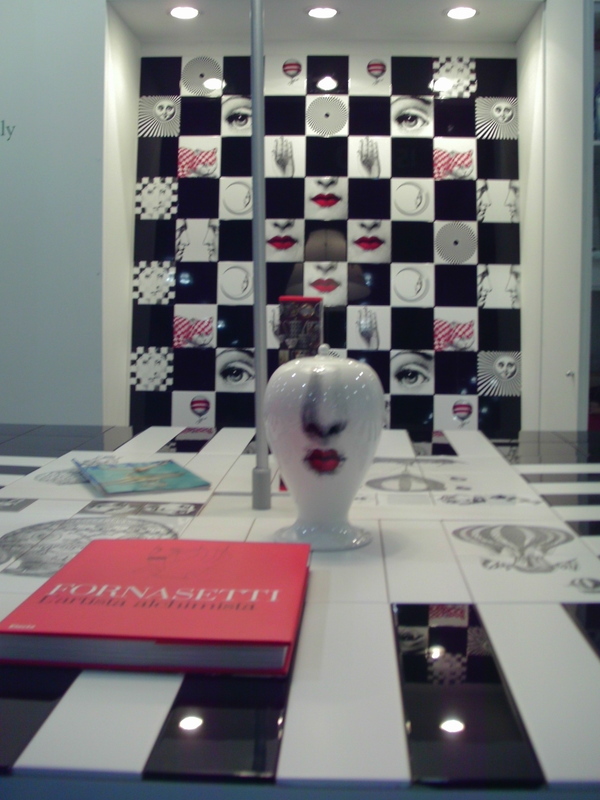 I was also delighted to see Bardelli’s homage to Fornasetti at the Ceramic Tiles of Italy booth. The iconic face of the Fornasetti woman can now be found on the company’s “Fornasettiana” tiles, perfect for those of us who’d mount the “tema e variazioni” plates on the wall as opposed to using them for more utilitarian purposes!